Kitchen cabinets take precedence in a kitchen both visually and momentarily. So, careful forethought must be exercised during its selection and it helps to know the types of cabinets available. Though professionally designed kitchens tend to have an edge over those standard lines, the gap between the two is narrowing as kitchen manufacturers are willing to build or customize cabinet designs to meet existing needs. This allows more interesting and inventive use of space. 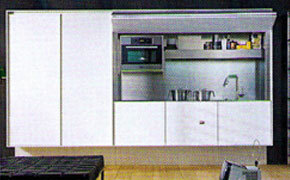 For an open, spacious kitchen design, wall units are to be used sparingly. Where they are used, ease of access can be addressed with tambour shutter and up-and-over doors offering space-saving alternatives to side-hinged doors that swing out at head height. An alternative to wall units is to build a bank of floor-to-ceiling cabinets with shelves, drawers, and racks, and incorporating the refrigerator and freezer. In most kitchens, a wall like this would supply enough storage to allow kitchen countertops and islands to be left clear. 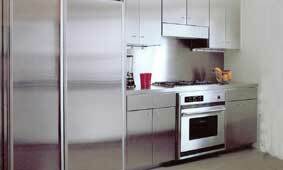 For a contemporary kitchen, select flat panel full-overlay doors for kitchen cabinets. Keep embellishments to a minimum and incorporate stainless appliances and hardware. All cabinets’ lines should also be straight, clean and simple as shown below. If you’d like to inject color to your kitchen, consider adding bright color against neutral for balance. As shown below left, the bright yellow of the cabinets are contrasted against the muted color scheme of the rest of the room. Else, cover it all in your favourite color such as the bright green kitchen below. Even the refrigerator and window shutter are painted in the same glossy shade. You may also have the cabinets arranged playfully in a step fashion for tall ceilings. That way, you accentuate the ceiling height while adding a touch of whimsy to the kitchen as seen below. Another idea is to have doors with interchangeable front cover patterns. To complement this, get the doors with rounded corners for a take on the ‘60s. Alternatively, invest in new wall units in your chosen hue and balance them with calmer-colored or more classically finished floor-standing units. 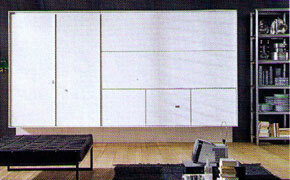 For the space-constrained, consider Alberto Colonello's 'On/Off' cabinet that contains a sink, hob and dishwasher. It features a remote-controlled door that folds down to shield the entire set-up. To ensure that your kitchen is well organized for efficient cooking, take a look at kitchen cabinet storage ideas so you may have more room in your cabinets and drawers to hide all clutter and keep the work area neat. For the budget conscious, you might want to take a look at renovation guide for existing cabinet. Click here to return to the top of kitchen cabinets.